Planning for your #OhmHour is usually as simple as "Turn everything off", but you don't need to sit in the dark during your #OhmHours. You just need to understand how much energy different appliances use, and be smart about what you leave turned on when an #OhmHour comes your way. And that's why we created the #OhmHour Planner. 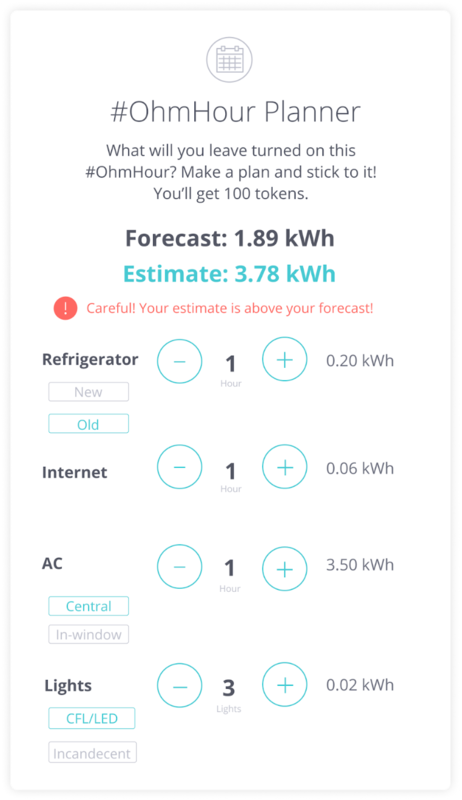 With the #OhmHour Planner, you can get a good idea of how much power, in kilowatt-hours (kWh), each of your appliances might use during a given #OhmHour. Using this, you can get an estimated idea of what appliances are the biggest energy hogs in your home, and determine which appliances you might be able to leave on during an #OhmHour. Here, you can add appliances and electrical devices that you have in your home to get an approximate idea of about how much power these items will use in a given hour. Then, compare this to your Forecast at the top to plan out your #OhmHour. If you plan it right, you may even be able watch some TV during your #OhmHour! We automatically start you off with your fridge and your internet router ON, since those are the most common appliances folks leave on all the time. Once you've done your planning, click "Count me in!". We'll award you 100 tokens if you do! Remember: These are estimates, and not a guarantee that you'll beat your forecast. Appliances listed in the #OhmHour planner show average energy use. Exact energy use will vary for different makes and models that you might have in your home. Be sure to check appliances that have standby lights — they draw power even when the device is off!